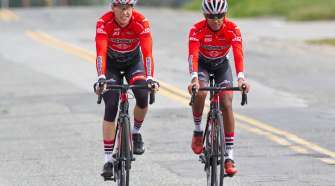 Canadians Catharine Pendrel (Luna Pro Team) and Raphael Gagne (Rocky Mountain Bicycles) won the final round of the USA Cycling US Cup Pro Series presented by Cannondale in Colorado Springs, Colorado. The wins gave both the overall 2015 US Cup titles as well. A 40-strong field of the top women in North America toed the line for the 2015 US Cup finale, including six National Champions from six different countries: Canada, USA, Mexico, Costa Rica, Columbia, Ecuador. Chloe Woodruff (Team Stans NoTubes) took hole-shot and set the early pace on the first lap. Later on that same lap, Catherine Pendrel (Luna Pro Team) moved past Woodruff and only teammate Katerina Nash could follow. These two would stay off the front for the majority of the race. Chloe Woodruff (Team Stans NoTubes) and Erin Huck (Scott 3 Rox) led the chase group, which ballooned and shrunk over and over again with Larissa Connors (Ridebiker Alliance), Georgia Gould (Luna Pro Team), and Rose Grant (Team Stans NoTubes) all coming back to them before being dropped. In the end, things were all decided on the final quarter lap when the lead group split in half and the chasing group was shattered. 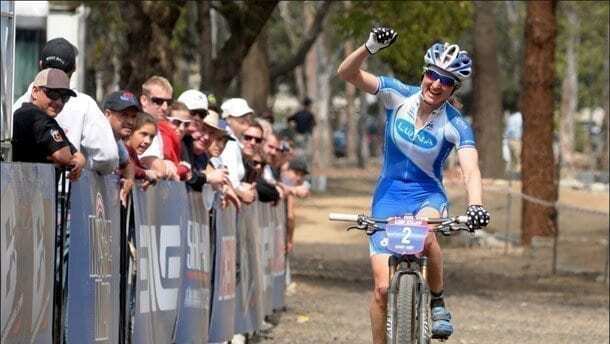 Pendrel attacked Nash within the final mile to win solo by just 15 seconds. The rest of the field staggered in one at a time, evidence of just how hard the racing had been. Further evidence of the difficulty was that as the temps rose from the high 70’s to the low 90’s, the womens’ lap times slowed from 15 to over 17 minutes throughout the day. The wind also picked up and made for a tough headwind on the long climb. Series leader Emily Batty (Trek Factory Racing) started and rode in the main chase group for the first ten minutes, but pulled out and was a DNF on the first lap, apparently with difficulty breathing. The Elite men started in the high heat and Todd Wells (Specialized Factory Racing) took the lead shortly after the first corner and didn’t let off the gas all day. After one lap, only Russell Finsterwald (SRAM / Troy Lee Designs) and Raphael Gagne (Rocky Mountain Bicycles) were left on his wheel. Gagne sat 3rd wheel and rarely took a pull, while Finsterwald moved to the front on a few descents but never was able to create any separation. By lap two a four-man chase group had formed consisting of Geoff Kabush and Derek Zandstra (both Scott 3 Rox Racing) and Keegan Swenson and Stephen Ettinger (both Team Sho-Air / Cannondale). 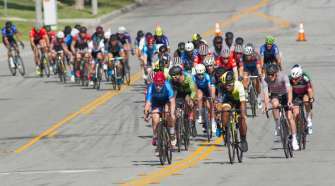 It was Kabush who did the lion’s share of the work in this group for most of the six-lap race, while the Sho-Air / Cannondale duo looked under pressure in the group and were eventually dropped. With one lap to go, the lead three slowed as Wells sat up and the gap came down to just fifteen seconds. Kabush took off in pursuit of the leaders but Gagne attacked hard with just one kilometer to go and took Wells and Finsterwald with him, eventually taking the win by just a few seconds. Wells and Finsterwald had a tight sprint for second place that the officials gave to Finsterwald. Wells was clearly upset after the race and filed an official complaint with the UCI. They did not change their ruling and the result stood. The final round of the USA Cycling US Cup presented by Cannondale series certainly shook things up. Wells’ controversial near-miss in the sprint left a three-way tie for third in the men’s standings behind the Canadian 1-2 of Gagne and Zandstra, and Batty’s misfortunes saw her chances at the overall win slip away to Pendrel. Men’s winner Gagne finished off an impressive showing in the 2015 US Cup, taking two wins, two second-places and a fifth at Sea Otter. This consistency led to his incredible 81-point victory in the overall raking. Pendrell showed similar consistency as Gagne, with two wins (Sea Otter and Colorado Springs), and podium places in the remaining rounds.